Amazon S3 Object Expiration - an easy way to automatically delete old files from Amazon S3 Bucket. Bucket Lifecycle Configuration. Amazon S3 Object Expiration. Bucket Lifecycle. Automatically delete old files from Amazon S3. Recently Amazon S3 Team announced Object Expiration, a new feature that allows you to schedule the removal of objects after a defined time period. Each expiration rule contains the prefix and an expiration period in days. The prefix (e.g. "logs/") identifies the object(s) subject to the expiration rule, and the expiration period specifies the number of days from creation date (i.e. age) after which object(s) should be removed. You may create multiple expiration rules for different prefixes. After an Object Expiration rule is added, the rule is applied to objects with the matching prefix that already exist in the bucket as well as new objects added to the bucket. Once the objects are past their expiration date, they will be queued for deletion. S3 Browser Freeware allows you to easily manage Object Expiration rules. You can find more detailed instructions below. How to add new Object Expiration rule. 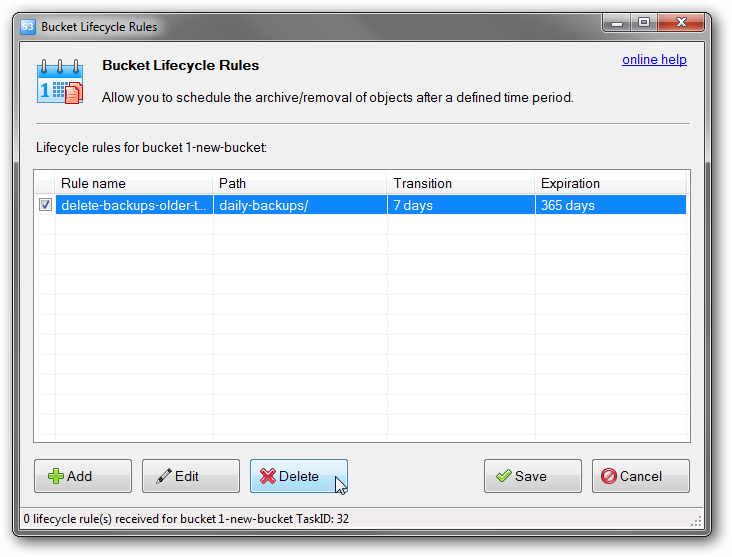 You can also use Ctrl+I keyboard shortcut to open Bucket Lifecycle Rules editor. 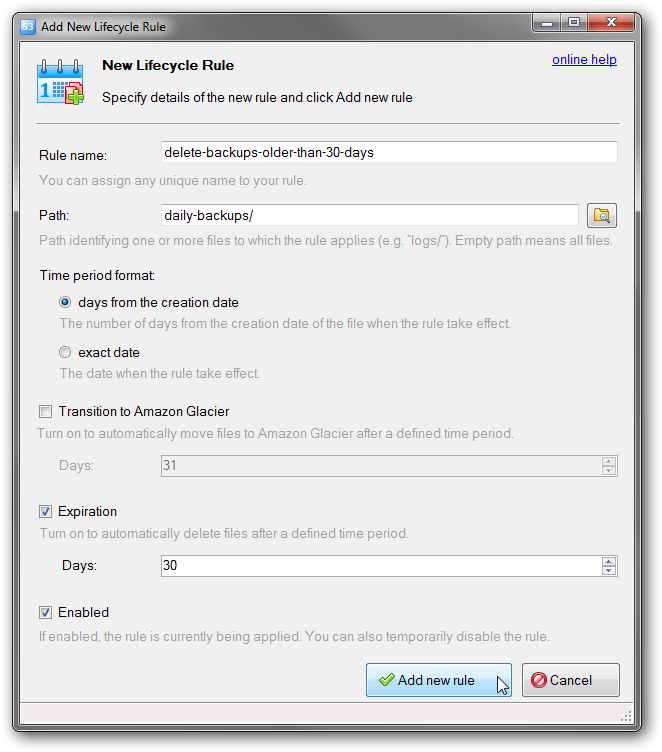 Object Expiration rules editor allows you to Add, Edit and Delete Amazon S3 Object Expiration rules. Add New Object Expiration rule dialog allows you to define new Amazon S3 Object Expiration rules. 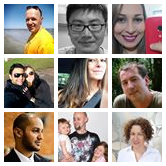 Enabled - the rule can be enabled or disabled. Mark this check-box to enable the rule. 4. Click Add new rule. To edit Object Expiration rule. 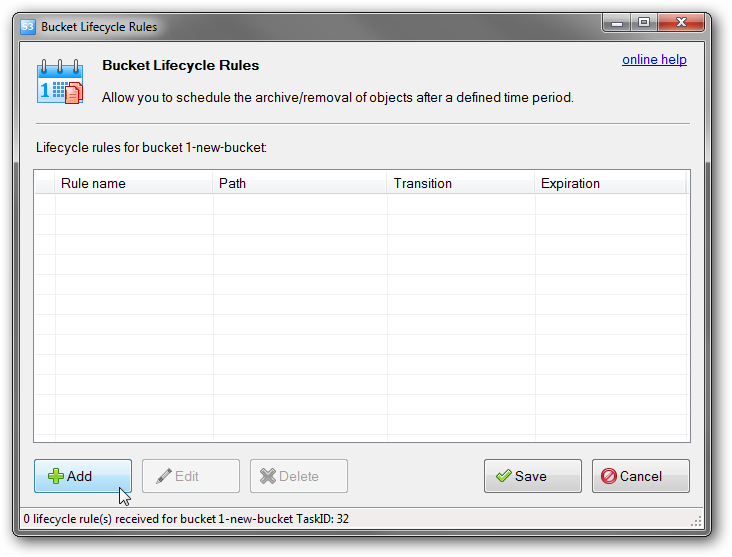 Bucket Lifecycle Rules dialog will open. 2. Select the rule you want to edit and click the Edit button. Select the rule you want to edit and click Edit. You can also double-click the rule to edit it. Edit Object Expiration rule dialog allows you to modify existing Object Expiration rules. 3. Edit rule' properties and click Save changes. 4. Click the Save button to send your changes to Amazon S3. 1. 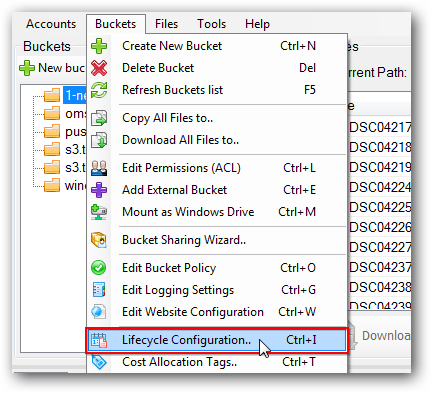 Click Buckets ->Lifecycle Configuration..
2. Select the rule(s) you want to delete and click the Delete button. Select the rule(s) you want to delete and click Delete. 3. 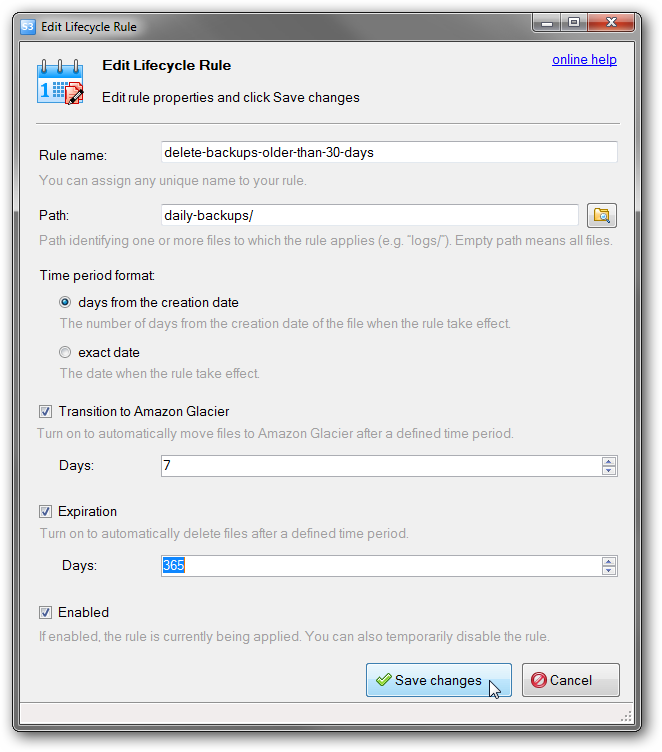 Click Save to submit your changes to Amazon S3.